In 2011 we went both camping (in September) and my mom and dad's (just last month) without a single emergency room visit! We've had at least one, if not two emergency room visits for years running on both those outings. So I'm going to go ahead and call 2011 a pretty great year. By this time next week, I'll be halfway done being pregnant. That and modern medicine haven't managed to totally stop the nausea though, so my dad suggested naming the baby, "I'm Not Throwing Up Anymore." But since we found out she's a girl, I think we're going to go with something a little more feminine. And here I thought they were just jogging! But I guess they have to get all those endorphins somewhere, after all. I guess I am an angry person, as I don't run, lol. I must have missed that you were expecting! Congratulations! Let's hope that nausea leaves you soon! Do they run from anger because they're happy? Or happy because they run from anger? In other news, I've never ever never ever written the word "because" without having to go back and switch the A and the U.
that is a kind of funny sign. hope your nausea subsides. I run and I am not angry... well rarely anyway!! Happy New Year to you too! and hope the nausea stops soon! 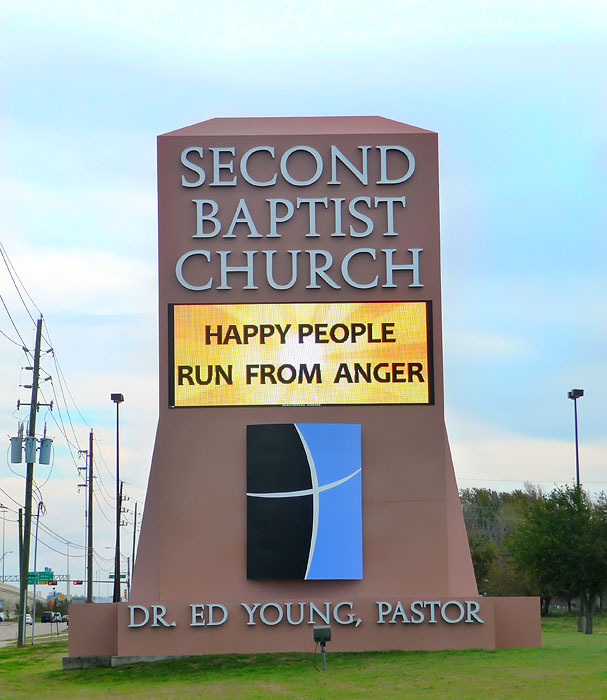 Notice that the people who run from anger are at the SECOND Baptist Church. I wonder what the first place Baptists do..... No I don't, not really. Hope you feel better in general! Reds & Tracy - Yeah me neither. I never run. And yet, I don't feel angry all that much either. So I don't know what's up with that. Maybe anger just forgot to chase us. Thanks Maria! Happy New Year to you too! BloggerFather - I was actually wondering that myself. Although to be honest, I keep picturing this avid jogger with a scared look on his face, anger hot on his heels as he makes his escape. Mark - Maybe the first place Baptists sprint from anger. Or maybe they're just running a little ahead. Happy People Run From Anger?? Congratulations on your coming child! 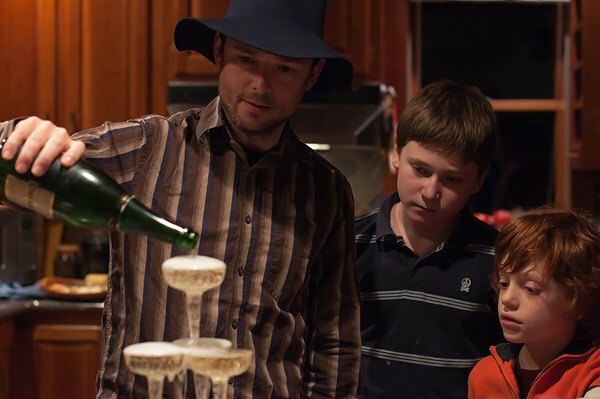 That champagne tower looks so cool, by the way. Thanks Brightened Boy! It was a little one this year, but still fun.